Dr. Gangrene's Mad Blog: Dr. Morgus for Rondo Hall of Fame!! It's almost Rondo Award time again, and I've started thinking about the nominees for this year's Rondo awards. The Rondo Awards, in case you’re not familiar with them, are an annual award started by David Colton to honor excellence in the field of classic horror. They have entries for everything from movies to books and music and everything in-between, including horror hosts. They also have a Hall of Fame category, and this is my favorite category of all. This is the one that awards a lifetime of achievement, those folks whose contributions to the field are so huge that they have left an indelible impression. There have been an impressive group of entrants to the Rondo Award Hall of Fame so far, including such notables as Forrey Ackerman, Ray Harryhausen, Ray Bradbury, Basil Gogos and many more. Each year 6 new inductees are added, and there have been 4 horror hosts added so far: Zacherley, Vampira, Ghoulardi, and Bob Wilkins, all very worthy entrants. The nominee I’d most like to see added this year is another horror host, and one who celebrated his 50th anniversary as a horror host this year – Morgus the Magnificent. Morgus started his program back in 1959 – and has been hosting on and off the air ever since. Morgus is played by actor Sid Noel, and he broadcasts in New Orleans area primarily, although it has been syndicated out to other areas of the country from time to time. 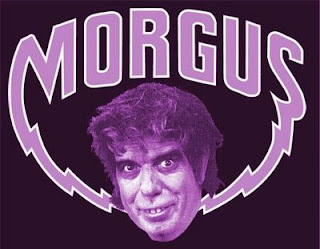 Morgus is a legend in the Horror Host field and truly deserving of inclusion in the Rondo Hall of Fame.